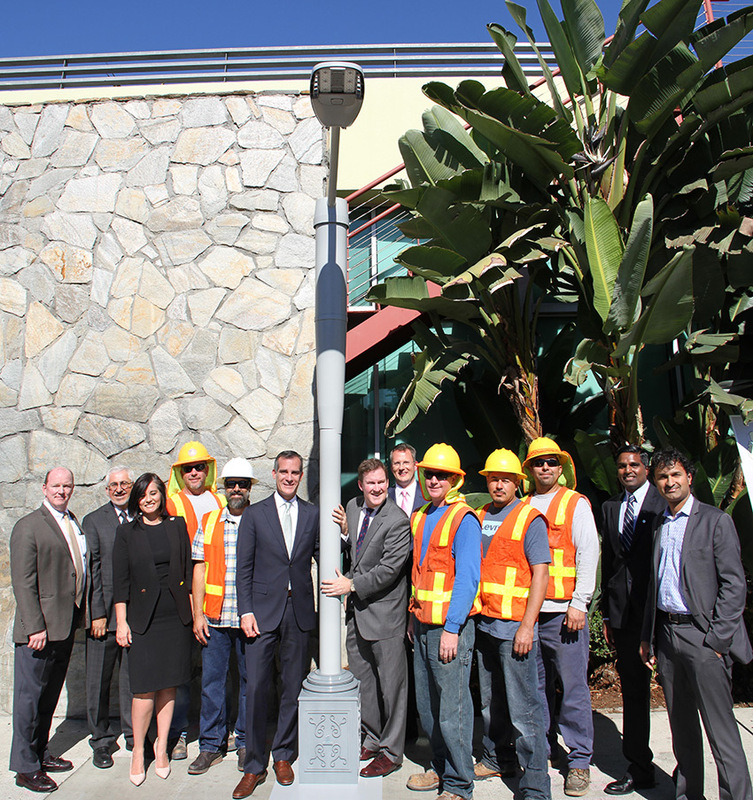 As if smart benches weren’t enough, today Mayor Garcetti unveiled the first of many Philips SmartPoles—energy efficient LED streetlights that house small cell wireless broadband technology. By the end of this week, a total of 24 SmartPoles will be installed in the Hollywood area. The poles were developed by Dutch tech and well-being company Royal Philips. Each SmartPole functions as a mini cell tower, bringing 4G LTE wireless service to pockets of the city that get poor reception. Spreading these poles across the city will increase data capacity for the network as a whole. The city plans to install 100 poles within the upcoming year, with 500 more to follow. It’s only appropriate that Los Angeles is also the first city in the world to implement SmartPoles—after all, one of our most photographed landmarks is a bunch of lamp posts. The best part of the deal is that the project costs taxpayers nothing. “[Philips] pays for the right to attach their smart cells to the top of our standard city streetlight poles,” Connie Llanos, press secretary to the mayor, wrote in an email. The company will then lease their cell sites to wireless carriers like Verizon. According to a statement from the mayor’s office, the project will bring in hundreds of thousands of dollars in revenue for the city. Maybe we can use the extra cash to start planting glowing trees. Next articleIt’s Ice Cream! It’s Fro-Yo! It’s… Frozen Pudding?